Hello Folks! Happy Fall! We did pick up some much needed rain this week, some areas more than others, but after a long, dry summer every bit helps. Locally the Otter seemed to have been the big winner, compliments of some significant downpours in the Rutland and northern Rutland County areas. Levels have seemed to plateau, and despite the big bump in levels, clarity is pretty good. Tribs did see a bit of a bump in levels, but are still low. Water temps have settled back as well. We’ve been seeing low 60’s on the creek for the past couple of days, and tribs are most likely a bit lower than that. I did not take a temp on any Otter trib this week, but am just basing that on history. With a fine weekend on hand and cooler water temps, local rivers could be busy this weekend. A more stable weather pattern should also kick some hatches up too. This time of the year on the creek especially, look for tan and October caddis, a few stray Isonychias and the diminutive, but plentiful Blue Winged Olive. Usually I think of a great BWO hatch during drizzly cloudy days, but while at Beldens last Saturday, there were quite a few coming off. Last Saturday was sunny. Regardless, the trout were not very active in the 68 degree water, but it was fun to see. With the bugs coming off, keep your nymphs closely resembling the naturals and get a good drift. It’s not too early to put the dry fly box away yet, and many nice fish come on streamers this time of year as well. Many anglers swear by the smaller white streamer this time of year. Closely resembling small fallfish and this years rainbow fry, a better fall color would be hard to find. Flies with some Orange probably come a close second! Also with the higher flows on the Creek and tribs if we get more rain, stonefly nymph patterns are productive. 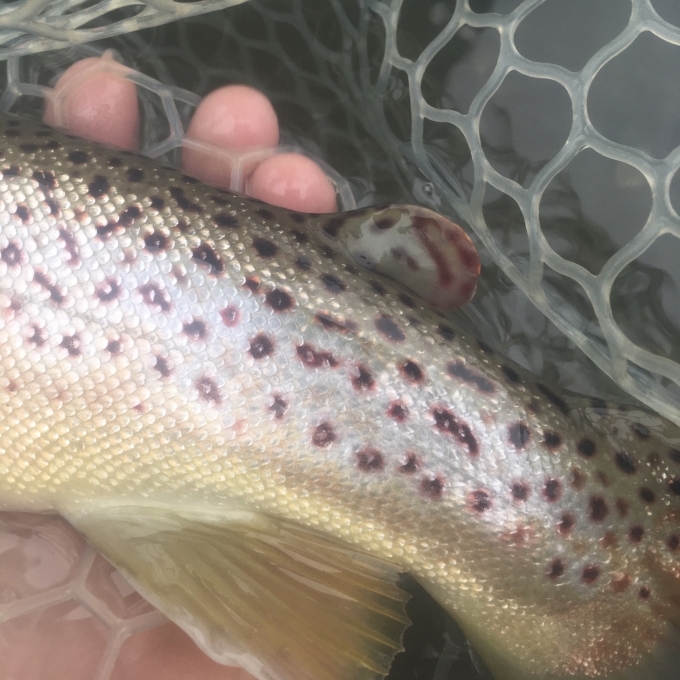 These big morsels lack the clinging power of some other aquatic invertebrates so get knocked loose easily during higher flows.